Heat oven to 160C/140C fan/gas 4. Grease 6 x 120ml madeleine moulds (see tip, below). Put 50g of the coconut in a food processor with the sugar and whizz until the coconut is as fine as the sugar. Tip into a mixing bowl with the butter, flour, egg and yogurt, and whizz with an electric whisk until smooth. Stir in the cherries, then divide between the moulds. Sit on a baking sheet and bake for 35-45 mins until a skewer poked in comes out clean. Cool for 10 mins, then turn out from the tins to cool completely. Heat the jam in a pan or microwave, then sieve to remove the cherry lumps. Tip the remaining coconut onto a plate. Trim any wonky bottoms of the madeleines so they sit flat. 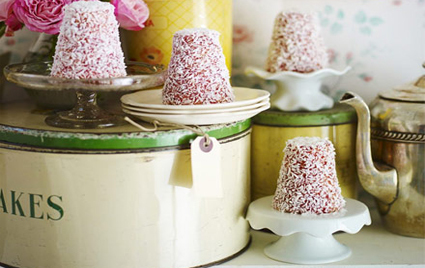 Brush a thin coating of jam over each and roll in the coconut to cover. Will keep in an airtight tin for up to 2 days.